I was debating if this little project even warranted a blog post because it’s so simple. Like really simple. But I figured if this little simple project was on my to-do list for months before I finally got around to it, it’s worth celebrating. Okay maybe celebrating is a bit strong, but it’s a good reminder to all of us that sometimes these little projects just take forever to get to but they’re still worth doing. 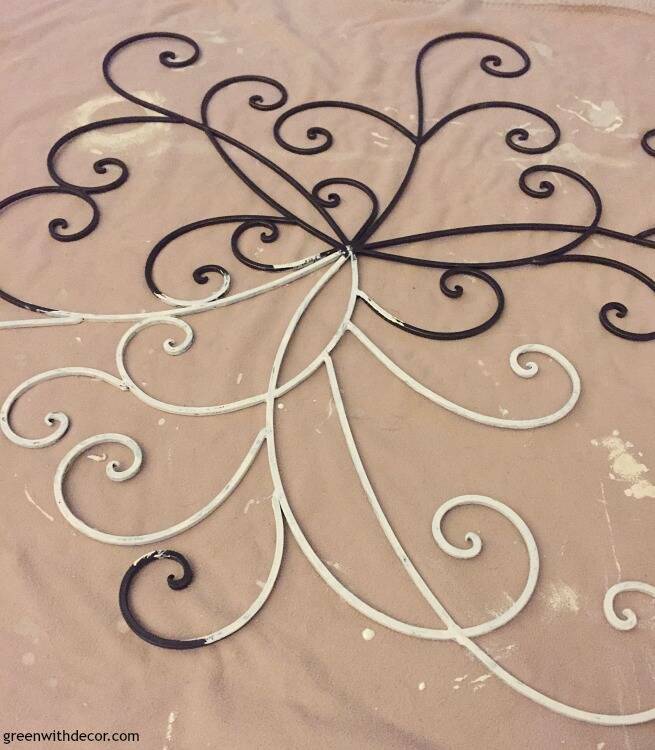 This metal piece used to be black, like a lot of things in our house, and I painted it white. No big story there, I was just ready to lighten it up a bit. Plus I’m a paint hoarder (collector), so this project cost exactly $0. I used Country Chic Paint’s Vanilla Frosting (surprise, surprise, my fave paint color). And now it looks lovely on the green wall. If you’re wondering, I got this piece at Pier 1 a while ago, but this one is similar. Here’s a link to the basket with the tissues. 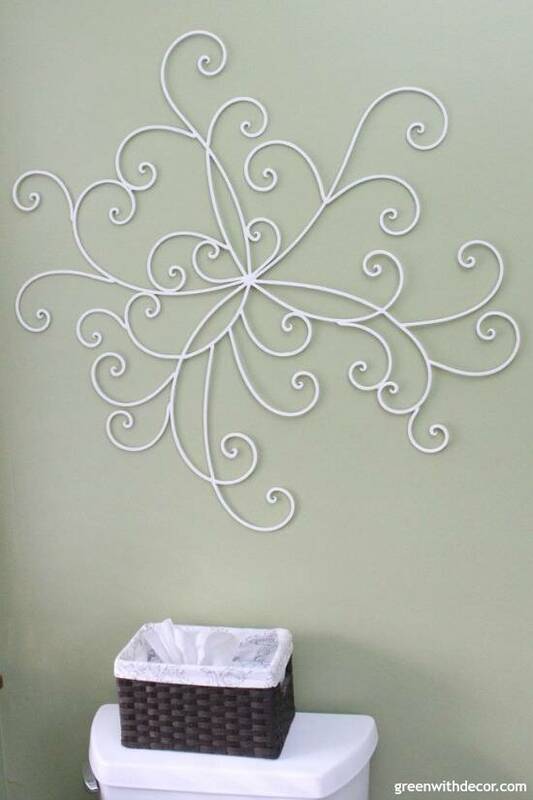 If you’re sick of your wall decor, remember paint is always a (free or cheap) option. Or even just moving pieces from room to room can make a space feel like new (whether you paint it or not). We had this piece in our family room for a long time, and the black worked with the red and tan in there, but I love the new white look with the green walls. Do you have any little DIYs that have been on your to-do list forever and ever? It feels good to finally cross this one off! I have a few other small updates to make to this rental bathroom to make it feel more ‘us’ and then we’re going to call it done. This little projects is a project for our master bathroom refresh as part of the $100 Room Challenge hosted by my friend Erin from Lemons, Lavender & Laundry, where bloggers update a room for just $100 (it’s possible!) in just a month. All of the other bloggers’ projects are linked below if you want to see. Or if you’re planning a full bathroom renovation, you can see all the details of our other bathroom renovation here (and get a free printable renovation checklist so you don’t forget anything!). Love your metal art. Freshening it up with white paint and reusing it in new room is simple but a great idea and inspiring. Thanks, Patti! It was such an easy update! Great way to update an interesting art piece! Simple projects are the best! I’ve been wanting to try Country Chic paint. They are! Even if they take forever to get to, ha! Country Chic Paint is awesome, I use it allll the time! Painting is always a worthy blog post, lol. I have so many things that have been on my to-do list forever I couldn’t pick just one! Haha! The project list is always long! It looks great repainted! Such a budget saver too! I love painting things I have had a while to give them new life. It’s so fun and saves money too! I know! Painting really never gets old! I love that little piece – it’s perfect against the green! I have a ton of little projects around the house that I only ever seem to get to during these challenges! I can’t wait to see the finish on this one, friend! Thanks, Kim! I love it with the green! Haha yes the challenges are good motivators! It’s amazing what a big impact you can make with a small change like this. I love the new color and it looks great in that spot! Right?! Gotta love paint! Thanks, Meredith! Yay for simple projects! I love that wooden spool project, too – I’m so glad you could use it in your house, too! Such a pretty, simple update! Just goes to show you the power of paint! Thanks, Maria! Gotta love the power of paint!